As you scope the flyers for last-minute back to school gear and perhaps sneak in a few last camping or beach trips, we are doing the last of the seeding (mostly for greenhouse crops now) and beginning to harvest some fall crops, such as cabbage and squash. Many of our students who work on the farm are also heading back to school, which co-incides nicely with our reduced labour needs as we near fall. There is very little planting and less weeding to be done now, but still a whole lot of harvesting. In fact, I believe the tradition of giving the kids a summer break originated with the need for their help on family farms during the summer months. A lot has changed since then! We still have loads and loads of tomatoes, so if you plan to do your own canning or freezing, now would be a great time to pick up some larger quantities from the farm store, open Fridays and Saturdays. Looks like we have another week of green peppers, although some of the peppers are thinking about turning red and yellow, so hopefully next week they will be extra sweet. The carrots are looking fuller and the lettuce is back to its big, beautiful self again- phew! Lettuce prefers the air to be a little cooler. 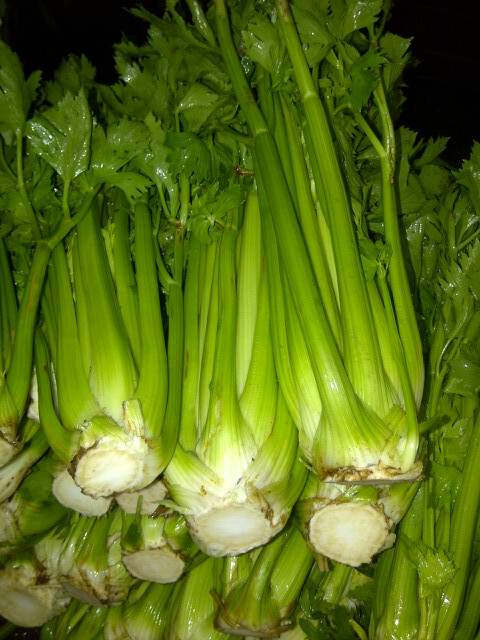 New this week is celery, which I think is looking great. 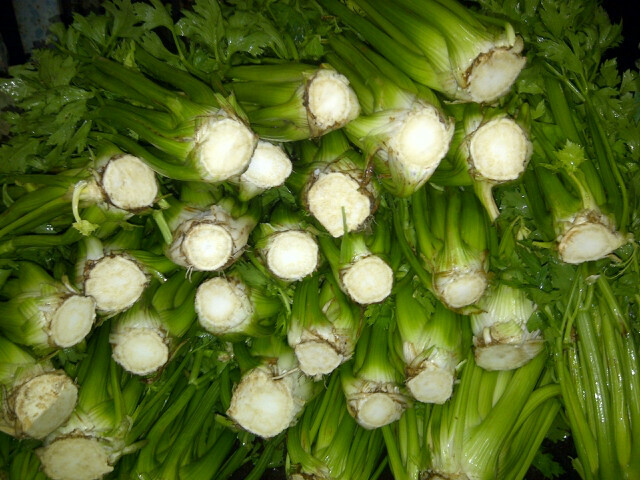 Celery is suprisingly hard to grow- it demands a lot from the soil and is greedy for water. It may be a slightly darker green than you are used to, but this also means it contains more densely packed nutrients like iron. Ths snow peas are doing very well with the cooler nights, and we will probably have them just one more week, so savour them! 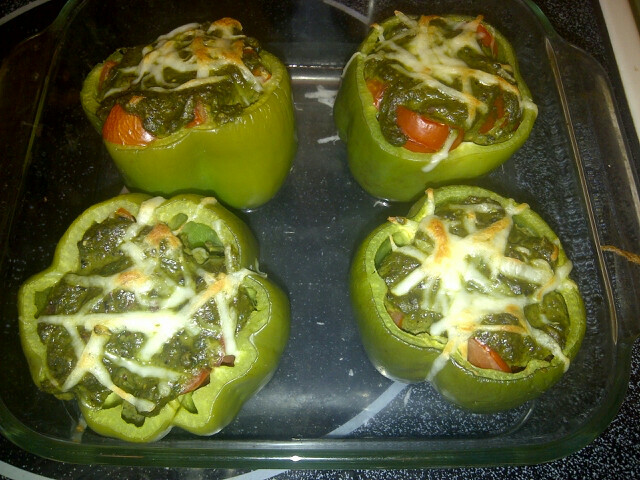 And now, what to do with more green peppers?- I say, stuff them! Be creative. 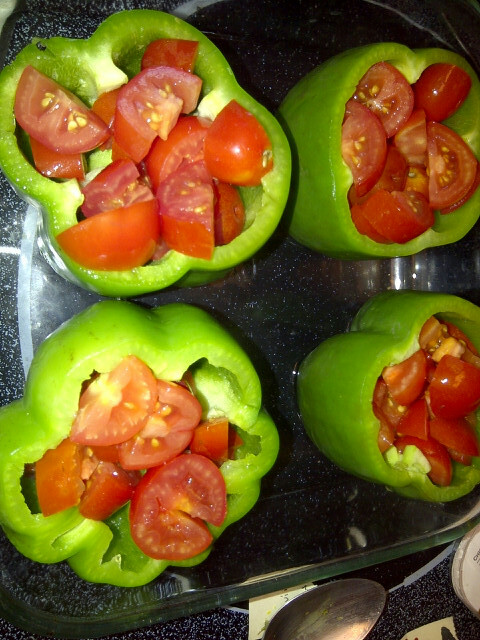 Below is what I tried with some pics in case stuffing peppers sounds intimidating. I also use them in sweet and sour pork or chicken, fajitas, on salads or with dip. 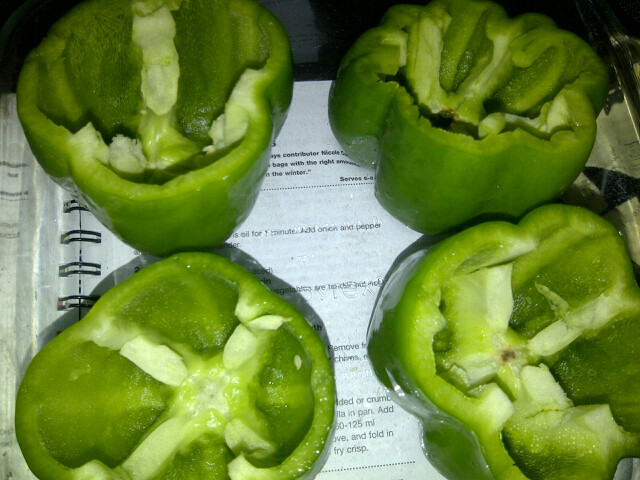 How do you like to eat your green peppers? Step 2: Place in glass baking dish in one inch water, cover with tin foil, and steam in oven for 5-8 minutes or until tender. Step 3: Fill steamed peppers with favorite filling: I just did chopped campari tomatoes, pesto and a little cheese but a starch would have been nice to absorb the juices (such as rice or quinoa). The recipe I was working from called for onion, garlic, corn, tomatoes, black beans, fresh oregano, parsley & cumin which were sauteed together before adding to the green pepper cups. I think I did it the lazy way, so if you are trying to impress, try sauteeing the filling first and adding some of the other ingredients.